uppumA can be prepared within a short time for an emergency. Normally we use rice, SUji (semolina/ravA) or sEmiA (vermicelli). Sieve the semolina well to ensure that it is free from impurities and worms if any. Roast in a tsp of ghI in a kaDAi for 5 minutes. Keep aside. Take the oil in a kaDAi and sauté the mustard, black gram dAl, Bengal gram dAl, ginger, green chilli pieces and curry leaves. If you use cashew nuts, red chillies and black pepper, you can add these also while sautéing. In the case of red chillies, reduce green chillies to avoid excess hotness. Similarly, reduce green and red chilli if you use black pepper, which should be used after it is crushed a little so as not to make it powdery as otherwise the uppumA will appear black. If you use onion, you can add it after cutting it into small pieces and sauté with these. If you prepare vegetable uppumA, then you can use cauliflower florets, finely cut carrot, cabbage, green peas, beans, capsicum and potatoes (use potato very little since the uppumA may become bland). Sautee for 5 minutes if vegetables are not used but if they are used for 10 minutes. Add 2 cups of water and salt. After it boils add the roasted semolina little by little while stirring simultaneously so that nu lumps are formed. This should be done faster. After adding all semolina, close the contents with a lid for 5 minutes. Remove the lid and stir and turn the contents well. Put off fire and serve. It goes well with gothSu, coconut chutney and SAmbAr. Some people use the residues of hot pickles also as side dish. 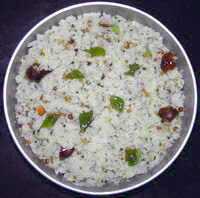 This is also done exactly in the above manner where the sEmiA replaces semolina. However, instead of roasting in ghI directly as we did for semolina, here we take all the vermicelli pieces in a bowl and add 1 to ½ tsp oil or ghI and then shake well to mix the oil or ghI prior to roasting and then roast so as to ensure uniform roasting. We use raw or boiled rice. In the case of raw rice prepare ravA or sUji in a mixie or if you have a flour mill nearby tell them to grind for uppumA. For 3 persons you need 1 cup rice. 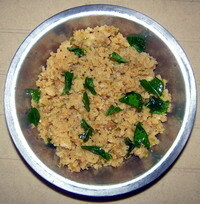 Grind it directly in a mixie for 1 or 2 minutes to ensure that the rice is not ground fine but very coarse like sUji. Before removing the jar, add 1 tsp split gram dAl (tUr) and ½ tsp black pepper and rotate for a few seconds. Remove the jar and spread the rice sUji on a plate. In case you use boiled rice, soak it in water for half an hour, spread over a cloth under the fan after draining out the water for 10 minutes before grinding coarsely as ravA. Here also you need to add 1 tsp split gram dAl and ½ tsp black pepper and rotate for a few seconds. Sautee in oil, all the ingredients, except coconut and asafoetida. Add 2 cups of water for raw rice and 1 ½ cups for boiled rice along with salt, asafoetida and grated coconut. When it boils add the ground rice ravA and stir well to remove lumps. When these thicken by reduction of water due to boiling, transfer these to a vessel and pressure cook for 1 or 2 whistles. Remove when the pressure comes down and serve after mixing 1 tsp of coconut oil. This goes well with gothSu, SAmbAr and coconut chutney. Here we take 1 cup of rice flour for 3 persons. We extract tamarind juice from lemon size tamarind with ½ cup of water. The extract should be thin. Add this extract to the rice flour with salt to taste and mix well. It will be like chapatti dough but loose in consistency. You can adjust the quantity of water or tamarind to get the required consistency of the flour or sour taste. Take 3 to 4 tbs of oil in a kaDAi and sauté mustard and black gram dAl. When the mustard splutters and the dAl has become golden brown in colour, add 6 green chillies pre-crushed in a mixie, curry leaves (10), ¼ tsp asafoetida and the rice dough and stir well all these together for 5 to 10 minutes till the contents are well cooked. If you observe any raw rice flour sprinkle some water over the contents, stir and close with a lid for minutes after simmering the flame. Remove the lid and stir well before you serve. This does not require any side dish. 1. Normally we take 1 ¾ cups of water for 1 cup ravA (semolina), but if we use vegetables, we increase it to 2 cups. In the case of rice maintain the quantity indicated. 2. If you prepare anything more, increase the ingredients proportionately to the number of persons, as these are given for 3 persons only. 3. Some people grind the boiled rice raw to break into grains like semolina directly in mixie but I have seen that this does not help preparing a good rice uppumA. Instead, you must soak it in water, dry and grind as indicated. This entry was posted on May 29, 2011 at 10:19 pm and is filed under uppumA with tags asafoetida, black gram dAl, black pepper, boiled rice, cashew nut, chana dal, coconut oil, curry leaves, ghee, ginger, grated coconut, green chillies, mustard, onion, rava, raw rice, red chillies, refined oil, rice, rice flour, salt, semia, semolina, split gram dal, suji, tamarind, toor dal, urud dal, vegetables, vermicelli. You can follow any responses to this entry through the RSS 2.0 feed. Both comments and pings are currently closed.